In Illinois, the adult American dog ticks are most active in April, May and June. By September, the adults are inactive and are rarely observed. The American dog tick can transmit Rocky Mountain spotted fever, tularemia and possibly ehrlichiosis to humans. 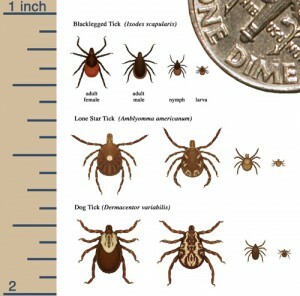 The lone star tick is most active from April through the end of July. Although it can transmit Rocky Mountain spotted fever, the lone star tick is not as likely to transmit the disease as the American dog tick. This tick may also transmit tularemia and ehrlichiosis to humans. The blacklegged (deer tick) can transmit Lyme disease and possibly ehrlichiosis to humans. The deer tick has been found sporadically in many Illinois counties. However, in recent years it has been common only in limited areas, mostly in northern Illinois. Deer ticks may carry Lyme disease which can be serious if left untreated. In 75 percent of the cases, a red circular rash develops at the site of the bite. Flu-like symptoms such as fever, chills, nausea, and aching joints may occur and reoccur for several weeks. If not treated, irregularities in heart beat, nervous system problems and arthritis may develop. Antibiotics are effective in controlling this disease if treatment is started early. 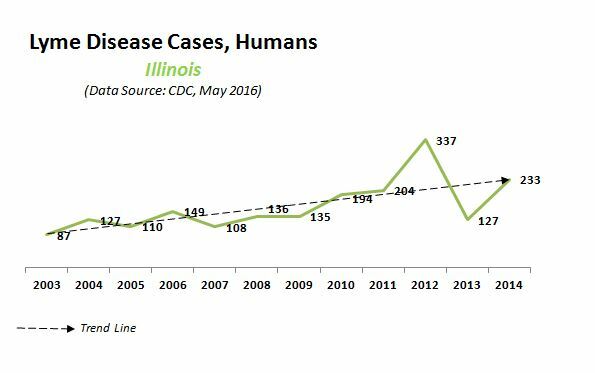 While the number of lyme disease cases in Illinois and Kendall County are relatively low, it is trending upwards through the years. Additionally, Centers for Disease Control notes that this disease is grossly under reported, possibly explaining the low case count. This picture shows the comparative size of a tick to a dime through their maturity. 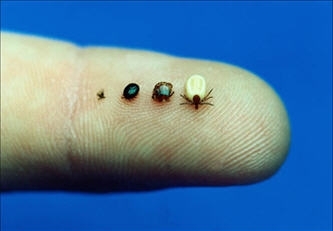 Ticks are among the most efficient carriers of disease because they attach firmly when sucking blood, feed slowly and may go unnoticed for a considerable time while feeding. Ticks take several days to complete feeding. Ticks wait for host animals from the tips of grasses and shrubs (not from trees). When brushed by a moving animal or person, they quickly let go of the vegetation and climb onto the host. Ticks can only crawl; they cannot fly or jump. Ticks found on the scalp have usually crawled there from lower parts of the body. Some species of ticks will crawl several feet toward a host. Because ticks are sensitive to dry conditions and do not thrive in short vegetation, they are seldom a problem in well-maintained lawns. Keep your grass mowed and keep weeds cut. Clean up items that attract rodents which can carry ticks, such as spilled birdseed, and hiding places like old wood piles. Always wear long pants with the cuffs tucked into socks or boots. Apply an insect repellent containing at least twenty percent DEET to socks, pants and exposed skin areas. Wearing a hat will help a lot and wear light-colored clothing so ticks are more easily seen and removed. After an outing, shower, shampoo and check your entire body. Wash clothing immediately in hot water. You should avoid tick infested areas. If ticks are present in vegetation along the edge of the property, insecticides labeled for control of ticks can be applied to small areas of high weeds that cannot be mowed. Often, one or two applications per season will be adequate to control ticks in these areas. 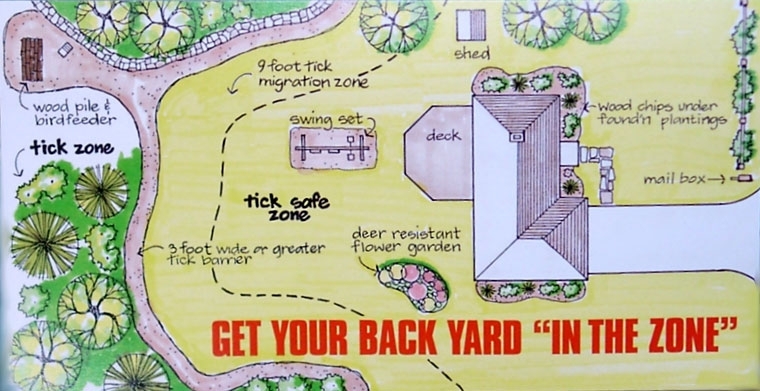 This diagram of a property shows a safe, tick-free zone for your backyard. Attached ticks should be removed immediately by grasping the tick with fine tipped tweezers where the head enters the skin. Pull the tick straight out with slow, steady pressure. Don't twist or squeeze. Do not handle ticks with bare fingers. Wear gloves, or use a tissue. Wash the bite area with soap and water and apply an antiseptic. If found on clothes, take the sticky side of tape and remove the tick before it can attach to you. If you want to have the tick identified, put it in a small vial of alcohol for preservation. Please click on the link and provide the requested information along with the sample. Samples and forms can be sent to your local county health department or the Illinois Department of Public Health at 535 West Jefferson Street in Springfield, Illinois 62761. 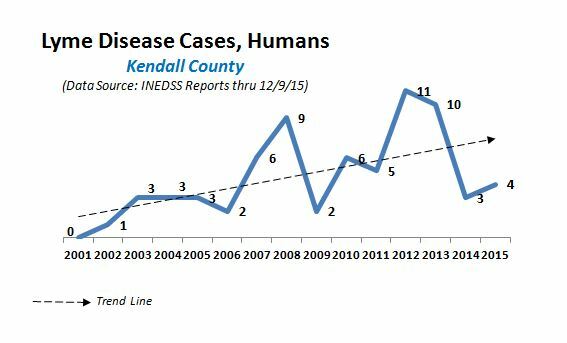 Starting in early 2016, the Kendall County Health Department began surveying different areas of the county for the presence of ticks, specifically looking for the deer tick, the principle carrier of Lyme Disease. Other tick species will also be collected. We are conducting this surveillance as this data will improve the accuracy of risk assessments that inform clinical and public health education and decision-making. This surveillance will be conducted in the spring and early fall as weather permits. Health Department staff is utilizing tick drags to conduct this surveillance. 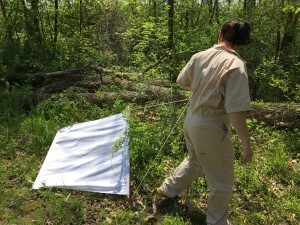 Staff using tick drag for collection. A selection of deer ticks collected are sent for testing for the presence of Lyme disease. Information concerning this surveillance and subsequent test results will be shared with municipalities, townships, the Kendall County Forest Preserve District and appropriate media sources. Data collected through our surveillance and testing activities can be accessed by clicking HERE.